If you’re looking to download a cute, casual game that you’ll be able to play when looking to kill time, you may be interested in playing Green Farm 3. Green Farm 3 is a strategy based game in which you’ll get to play as a rookie farmer who has just inherited a farm from their uncle. 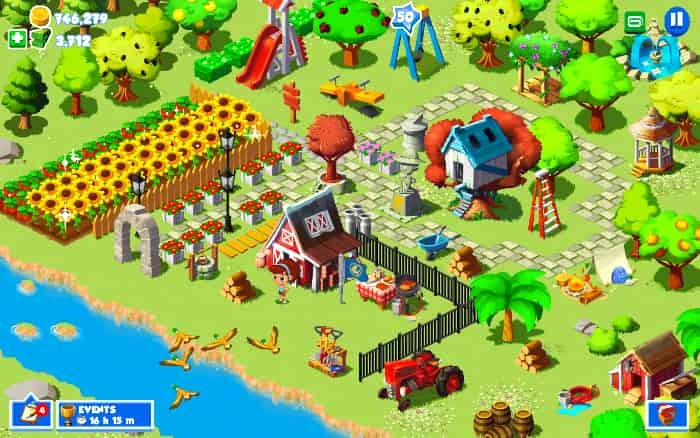 The object of Green Farm 3 is to restore your farm to its former glory and to become the most famous farmer around. 1. You’ll get to a restore a grand manor. As well as inheriting a farm, your character will also inherit a run-down manor, which you’ll be able to restore with the help of your friendly neighbors. 2. Green Farm 3 boasts a wide variety of fun-filled missions. If you enjoy playing games which boast challenges and missions, you’re in luck as Green Farm 3 offers a wide variety of missions. Examples of which include harvesting missions and crafting missions. Both of which will give you clear goals to work towards achieving. If you’re curious, in one popular mission you’ll be tasked with raising a pet dog, in order to protect your farm from potential threats such as wolves. The latter of whom may try to kill your livestock. 3. You’ll be able to make countless friends in Green Farm 3’s friendly town. As many hands make light work, it’s a smart idea to make as many friends in Green Farm 3 as possible. If you’re unsure of where to start, you can’t go wrong trying to befriend your farm’s immediate neighbors. Who’ll be able to help you expand your farm and restore your farm’s manor, quicker than you thought possible. 4. It features an engaging storyline that will keep you hooked. As casual games which feature engaging storylines tend to be more fun to play than games, which lack a storyline, it’s definitely well worth playing Green Farm 3. As its storyline will keep you guessing and involves a wide variety of characters, who you’ll get to meet as you progress through the game’s carefully crafted storyline. 5. You’ll get to play limited time events. Green Farm 3 offers limited time events on a regular basis, so even if you complete its primary storyline, you’ll still be able to spend countless hours playing Green Farm 3 and completing brand new limited-time events. All of which will offer insane rewards, that are well worth trying to unlock. 6. You’ll be able to raise a wide variety of adorable animals. Some of the cute animals which you’ll be able to raise on your farm include pigs, goats, chickens, dogs, horses, and bulls. 7. You can also make money by selling produce and honey. As well as raising livestock, you’ll also be able to make money to expand your farm and to renovate your manor by selling fruits and vegetables and honey. So if the idea of building a flourishing farm appeals to you, it’s well worth downloading Green Farm 3 for PC. As you’ll soon become addicted to maintaining and expanding your farm. Sometimes when playing Green Farm 3, bluestacks ask you fee to pay but gives you option to download some apps. Every time it asks you just select “Install apps” and continue using it free. I hope you enjoyed this article, please rate and share. If you have problems running Green Farm 3 on your desktop or any other issues, leave a comment below.